and lists of all quarter peals rung in 2016, 2015, 2014, 2013, 2012, 2010, 2009, 2008 and 2007. The data used for this report has been extracted entirely from BellBoard and includes quarters rung in the geographical boundaries of the Diocese of Ely. A total of 556 quarters have been recorded, which is down on last year’s total of 572 and 2015’s 583. This year’s number includes 51 quarters being rung by visiting groups holding quarter peal weekends or weeks in our Diocese. The running order of the Districts remains the same with 264(253) in the Cambridge District; 144 (158) in the Huntingdon District; 131(149) in the Ely District; and 17(12) in the Wisbech District. These figures do not represent the district ringers taking part as there is much crossing of borders. This represent 8% of the ringers taking part, with 36% only ringing 1 quarter and 56% ringing 2-19. It is the same three leading conductors as last year but in a different order with Edith Robinson taking over the first place with 49, Janet Garnett second with 45 and third Phillip George with 39. Conducting for the first time was Emma Davies. Hopefully this will be a major step in their ringing career and indeed 5 have already gone on to ring more quarters. First in hand: Alistair Benfold, Iain Hayden and Oliver Winter. 61 (48) quarters were recorded as service ringing which is 11% of the total, therefore the remaining 89% must be for other events or just for fun. We must thank all those incumbents and churchwardens who readily give us permission to ring and use the valuable equipment in their towers usually at no cost. Not many hobbies can be carried out at no or minimal cost to the participants for the use of such equipment. Meldreth takes the top position with Cottenham and Trumpington in 2nd and 3rd places, pushing last year’s leader St Edwards Cambridge into 5th place. Numbers on handbells have decreased significantly this year 39(51). Only 4 date touches of 2017 changes were rung this year and a touch of 1972 to celebrate a 45th wedding anniversary. I have been looking back over the 18 years I have been extracting all this information, now that I am passing over to a new Quarter Peal Secretary. The figures quoted below are from my records and may not include quarters not published, or published late, or any that I missed when physically searching the Ringing Worlds, so there may be discrepancies with tower or personal records. I must admit that now we have BellBoard it is much easier to extract the information, but as I say below quarters not posted immediately after ringing are old news! We average 483 quarters each year. Obviously, there are highs and lows, a low period being 2003/4, both years being under 300, and the most we have achieved is 625 in 2011. I cannot see any special events or lack of events such as Millenniums, HM Queen celebrations, etc. that have affected these totals. 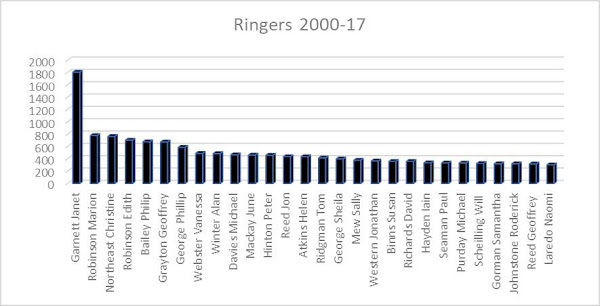 Looking at the ringers who have taken part, it is interesting to see that a total 154 different names appear in the lists of those who rang 20+ quarters. Some have appeared nearly every year from 2000, some not joining the list until the years in between, the latest year being 2011. Those achieving 300+ during this time are in the chart below. 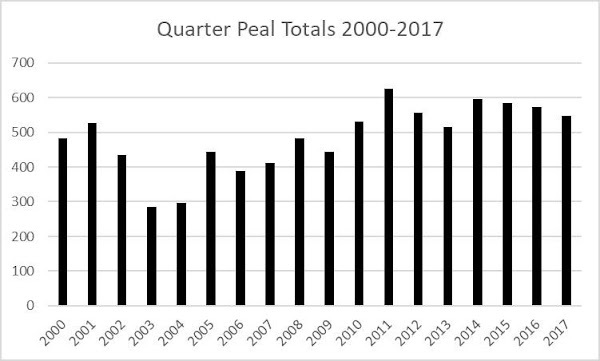 Over the 18 years there have been 405 first quarter peal ringers, this averages out at 22.5 per year. But are they still ringing today? Just looking at the 5 years 2012-16 we totalled 88 first quarters, but of these only 34 of the names appear again in 2017’s lists. Hopefully they are all still ringing somewhere, they may not be ringing quarters for a variety of reasons, but have become invaluable members of bands for practices and Sunday service ringing. It is also interesting to see where quarters are rung. 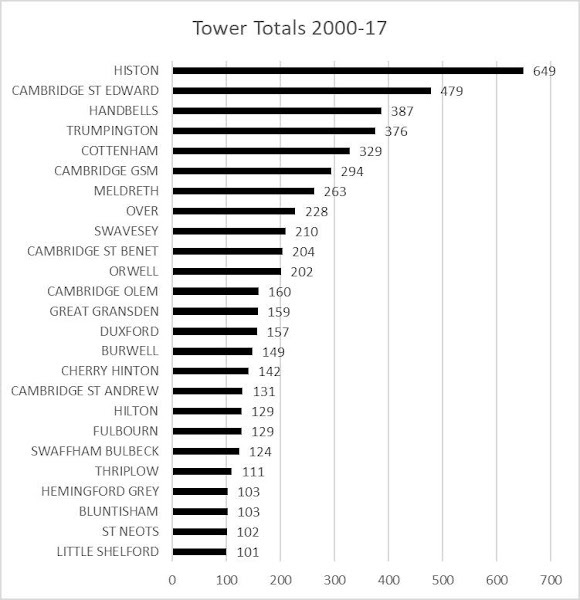 In most towers the numbers are spread across the years with odd years where there was none. Coming on line and with a continued use are Bluntisham (2004), Great Wilbraham (2006), Little Eversden (2007), Toft (2005). Obviously, this might be after restoration projects or influx of new ringers. Those towers reaching 100+ are listed in the chart below. 108 towers recorded 2-50, and 23 towers recorded 51-99. A question comes to mind - Do the quarter peal ringers come from flourishing bands at the towers appearing in the table above? % Quarters submitted a week late are old news! % Christian names please and if applicable middle initial.